I sought out a review copy of Breakfast with Bonhoeffer : How I Learned to Stop Being Religious So I Could Follow Jesus because I was curious about it. I've read Bonhoeffer's Life Together (highly recommended) and Eric Metaxas's biography (linked - and highly recommended!). Bonhoeffer is a very curious and interesting person and I find him and his writings to be rather fascinating. I knew nothing of Jon Walker going into this book and I left it so. I know that some people love to research a book before picking it up but I find myself disinclined to do that as a general rule. A concept for a book can interest me enough to pick it up and I like fun surprises and always hope to find one. So, without much fanfare, I started reading Breakfast with Bonhoeffer . Walker wrote this book on the heels of another book he penned ont Bonhoeffer called Costly Grace: A Contemporary View of Bonhoeffer's The Cost of Discipleship . As he was researching and writing Costly Grace his life began slowly unraveling. He lost his job, his house, his savings and was diagnosed with bi-polar II disorder. Then, just a few days before his twenty-fourth wedding anniversary, his wife filed for divorce. 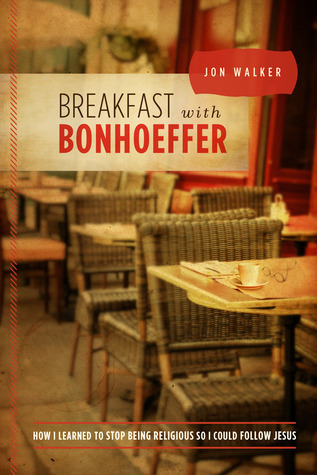 This new title - Breakfast with Bonhoeffer - is Walker sharing how he wrestled with his faith in light of Bonhoeffer's writings in the midst of what can only be described as chaos. Things to know about Walker going in from a theological standpoint: he was in the ministry for over twenty years as a Southern Baptist pastor. Rick Warren is his mentor (and pastor?) and Walker attends Saddleback Church. Things to know about Walker from a literary perspective: his writing style is remarkably similar to Donald Miller of Blue Like Jazz fame. In fact, I thought of Miller several times in the reading of this book. The main message of Breakfast with Bonhoeffer seems to be: grace is available no matter what sins you commit; don't crack down too hard on yourself if your life doesn't turn out the way that you expected it would. We all make mistakes, and suffer from the mistakes of others. Grace. Walker is not mistaken in his belief that there is grace. He is also sharing such truth in a very accepted and popular way: by couching this message in his own troubles. It seems everywhere I turn someone is telling me that God loves my broken life "better than a Hallelujah sometimes." This message is so prevalent - (and, grant it, we live in a society which encourages Christians to turn away from Christ and not fret so much about obeying his commands....which ultimately leads to their broken lives) - that I have to confess I'm getting a little tired of hearing it. Because the world is filled with distractions from Christ, it seems to me we should put more emphasis on learning Christ and scripture than we do. We could stand some preemptive strikes against sin instead of assuming "everyone does it" and, in essence, allow sin to abound so that grace will also. Please hear me: grace does abound. But we should strive not to sin. Part of me is tempted to throw this book under the bus to some extent. It's just more of the same which you see today. "Yes, you are broken. We assume you are or very soon will be. Brace yourselves. But don't fret! Jesus is still here." And He is. And He is very mighty to save. I am not even going to attempt to deny such a basic truth as that. He is gracious and merciful; He redeems and transforms. And if, in the midst of Walker's meanderings through his life trials, he had not constantly brought it back to the cross, I would, in fact, ditch this book. But for his focus on the cross and the writings of Bonhoeffer, this book would be Walker's personal diary and I don't think we really needed to hear it as we are desperate to know scriptures. "With each step, we learn, like Abraham, that the promise does not depend on what represents our Isaac, but on God alone. Jesus is teaching me about a ruthless love that gives no quarter to an anemic, nice-guy Christianity. He is my king and he will take what he must take and demand what he must demand in order to prepare me for the kingdom of Heaven. As I say, Walker meanders through the experiences in his life the same way Donald Miller does and I find that approach diary-like and distracting. But when I draw out quotes scattered about - as you see from pages 41, 87 and 196 - then I am better able to see the message which I believe Walker would like us most to know. That is? : life is hard, God never meant us to think that it would be easy, and following Christ requires and demands sacrifice. No matter what we think or feel, He IS working all things together for our good and for His glory. I do not disagree with that message in any little respect. I just wonder how easy it is for Random Reader to pick this book up and see it. When I closed the book I wasn't thinking about costly, beautiful grace. I was thinking about how Walker confessed that he hasn't been managing his bipolar disease very well. I was ruminating on his description of how he feels in relation to being separated from his sons as one result of the divorce. And I'm wondering what brought about his wife's desire to leave him in the first place. And why Walker didn't confess that He failed in marriage also? My thoughts are very much not on Christ and His work on the cross and because I'm left wondering about the holes in his writings and weak arguments for costly grace. Ultimately, I hesitate to recommend it. It's not a bad book. But it's not a great book. I guess we could say "it's real" but I don't know how much value there is in that. In short: I like the concept for the book but I just don't feel comfortable saying that I think it's a strong one for delivering the message that following Christ requires something of us. And we, as a Christian society, are desperately in need of that message! My thanks to Leafwood Publishers who provided a copy of this book in exchange for my honest opinion. So really, this had little to do with Bonhoeffer...but his name in the title is a selling point? Err. I am liking your reviews, even when you can't recommend a book! I've haven't read anything by Bonhoeffer yet (someday, maybe?) and haven't read Blue Like Jazz. But this sounds like the style these days. I hadn't been drawn to this book anyway, though I knew nothing about it except the title before now, but I think I'd have mixed emotions about it, too. I really enjoyed reading this review, Carrie. It sounds like one should just stick with reading "The Cost of Discipleship" which really is outstanding and obviously has much more depth than this book. I notice that two of the four quotes you cite are directly from Bonhoeffer. Good points and thanks for sharing your review. I get tired of the fluffy Christianity that is popular today. The Bible is clear about calling sin "sin" and avoiding it. Grace is important but so is leading a disciplined life. Yeah, that is the direction I was sort of assuming this book was going. If you read it and loved it I was planning on giving it a go, but I don't plan on reading it. I mean, I hesitate to say we've had enough grace, because we need SO much. And it IS wonderful that we have Jesus, but it almost seems like we've gone so far on that side that it's like, ok...but what about working out our salvation and fleeing temptation?